FARNBOROUGH, England. 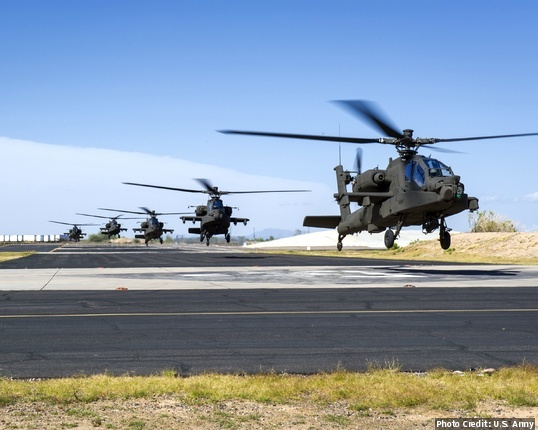 U.S. Army officials selected LONGBOW LLC -- a joint venture of Lockheed Martin and Northrop Grumman -- to provide LONGBOW Fire Control Radar (FCR) hardware for Apache AH-64E helicopters and will support the Army's lots 7 and 8 production contracts plus three international customers. The contracts include LONGBOW FCR Mast Mounted Assemblies (MMA), Radar Electronics Units (REU), and spares for the U.S. Army, United Kingdom, Saudi Arabia and Qatar, making Qatar the 13th international customer to receive LONGBOW FCR. Production will extend through April 2021 at Lockheed Martin's Orlando and Ocala, Fla., facilities and at Northrop Grumman's Baltimore, Maryland, facility. Jim Messina, LONGBOW LLC president and director of LONGBOW programs at Lockheed Martin Missiles and Fire Control, says "This contract allows us to supply the U.S. Army fleet with REUs, which is the foundation for future enhancements like extended range, maritime mode and unmanned aerial systems detection."